When NVIDIA started developing integrated chipsets the expectations were fabulous - some predicted even the soon death of external video cads. However, the problems related with insufficient RAM throughput didn't let them get high 3D speeds with the integrated graphics - x86 mainboards with 256bit buses couldn't help it, and the memory had to be standard because it was shared between the processor and integrated graphics core. Nevertheless, the 3D scores of the second chipset - NVIDIA nForce2 - were pleasantly high. Although they were still much lower than those of the mid-range add-in cards, that integrated chipset was the only such solution ensuring more or less good performance in games. ATI and Intel actually had nothing to offer. The former failed to push its desktop chipsets Radeon IGP 320/330/340 into the mass market, and the latter didn't make any visible steps to equip its leading platform with fast integrated 3D. Although the performance bar grew up with the i845G/i845GE/i865G, the speeds were still far from the nForce2. Early this year we tested mainboards based on ATI's chipsets designed for Socket 478 and Socket A. The scores were very bad: the industry leading partners promised by ATI (including FIC and Gigabyte) had nothing to offer us, and the boards from other companies were slower even than integrated solutions from VIA and SiS in non-gaming applications, while 3D performance was the same (sure, they were much weaker even than the first nForce). Today we are pleased to present one more integrated 3D solution for the Socket 478 platform - ATI's new chipset named Radeon 9100 IGP. ATI says that its integrated graphics core is based on the Radeon 9200, which stands on the level of the GeForce4 MX in nForce2. Let's see if it's a really good solution. 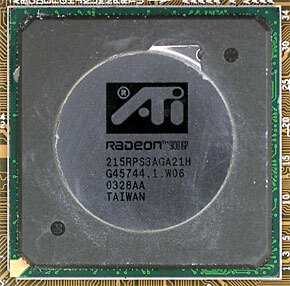 In short, the Radeon 9100 IGP has functionality very close to the Intel 865G. Let's compare them. Definitely, the Radeon 9100 IGP has a more advanced graphics core regarding resolutions supported, video, dual-monitor support and integrated TV-Out. The memory controller is probably better as well (we can check if it's so), as well as 3D speed of the integrated graphics core. On the other hand, it has a weaker south bridge deprived of the Serial ATA or ATA133. Although many don't care about it but it's not a good sign not to have features supported in all solutions from other leading companies (regarding this platform). The FSB 800MHz looks suspicious because at the time of release it supported only 533 MHz and the support for 800 MHz wasn't voiced separately. But it's not difficult to check if its operation is stable or not as there are tests that can heavily load the FSB. 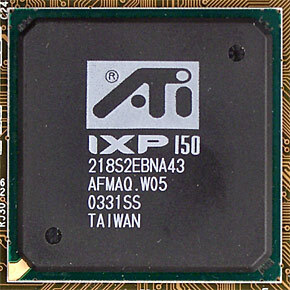 ATI's chipset is compared to its direct competitor i865G. We have a clear idea on Intel's product and we can estimate the Radeon 9100 IGP in comparison with any other chipsets through the i865G (which in case of the external card performs identically to the i865PE). Note: "int"/"ext" stands for internal/external graphics. In applications critical to the memory access speed the Radeon 9100 IGP falls far behind the Intel chipset (up to 20% in archiving), especially in case of the add-in card, i.e. when the memory bus is not loaded additionally with the graphics core. It indicates that the memory controller of ATI's new chipset is pretty weak. On the other hand, in real applications (archivers) the difference is noticeably less than in the low-level Cachemem benchmark. The weakest point of the Radeon 9100 IGP is the read speed. In the video encoding test it loses only 6%, but even paired with the external card it still falls behind the integrated i865G. However, in some applications (like MP3 encoding or final rendering in 3ds max) the performance less depends on memory and the R9100 IGP can catch up. Now comes the most interesting - 3D games! While with the external card the ATI chipset still loses the battle (about 10%), the integrated graphics core helps it smash the i865G into pieces. It loses only once - in Return to Castle Wolfenstein in the low resolution at 16-bit color (where the performance is most likely limited by the memory throughput rather than by the 3D accelerator). ATI's new chipset looks a successful solution in spite of its downsides - the poorly equipped south bridge and a low RAM speed. It turns out a success thanks to the integrated 3D accelerator. Such integrated graphics has decent playability. With rich video handling functions and TV-Out the computer turns into a good inexpensive home solution. The visual quality at 1024x768x32 is excellent (integrated chipsets are often blamed for blurry images). We believe that the 2D quality of the Radeon 9100 IGP is simply the same as that of ATI's external cards. ATI Radeon 9100 IGP coupled with an external card doesn't make much sense. The boards on this chipset will be slower than i865PE based boards, with the price being the same or higher. That is why the R9100 IGP makes sense if you are going to use only the integrated graphics. So, the Socket 478 platform has finally got a chipset with a good speed of the integrated 3D accelerator. The Socket A feels better as it has the nForce2 IGP at its disposal, and Intel's platform is still deprived of speedy integrated 3D graphics.